Info "Grind it and make everyone happy!" 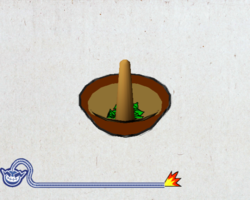 Stir Crazy is one of Penny's Microgames in WarioWare: Smooth Moves. Its name is a possible pun on stir crazy, a expression that means a person that becomes restless from feeling trapped. The player has to mix the solution by moving the Wii Remote in a circular motion. As each level progresses it will take longer to finish. 1st level difficulty: Grind herbs (rice in Japanese version). They are then taken to a pasta dish (the rice is taken to a Japanese pot in Japanese version). 2nd level difficulty: Whip cream. It is used on a cake. 3rd level difficulty: Stir the solution in the cauldron. It is poured on the head of a sorcerer and he then grows hair. For unknown reasons, this microgame's music does not appear in the Sound Studio. This page was last edited on October 11, 2018, at 22:37.